On Monday 22nd April 2019 the sun will rise at 06:02 and will set at 20:17. It will be a mild day, with temperatures reaching around 19.2°C. Today is expected to be a dry day, with a very low chance of rain. It will be quite a breezy day, with a maximum expected wind speed of 18mph. On Tuesday 23rd April 2019 the sun will rise at 06:00 and will set at 20:19. It will be a mild day, with temperatures reaching around 20.9°C. Today is expected to be a dry day, with a very low chance of rain. It will be quite a breezy day, with a maximum expected wind speed of 16mph. On Wednesday 24th April 2019 the sun will rise at 05:58 and will set at 20:21. It will be a mild day, with temperatures reaching around 13.7°C. Some moderate to heavy rain is expected, 9mm of rainfall is possible today. It will be quite a breezy day, with a maximum expected wind speed of 20mph. On Thursday 25th April 2019 the sun will rise at 05:56 and will set at 20:22. It will be a mild day, with temperatures reaching around 12.8°C. Some moderate to heavy rain is expected, 7mm of rainfall is possible today. Some quite strong winds are possible today, with a maximum expected wind speed of 38mph. On Friday 26th April 2019 the sun will rise at 05:54 and will set at 20:24. It will be a mild day, with temperatures reaching around 12.4°C. Today is expected to be a dry day, with a very low chance of rain. Some quite strong winds are possible today, with a maximum expected wind speed of 40mph. On Saturday 27th April 2019 the sun will rise at 05:52 and will set at 20:26. It will be a mild day, with temperatures reaching around 11.2°C. Some moderate to heavy rain is expected, 5mm of rainfall is possible today. It could be quite a gusty day today, with a maximum expected wind speed of 30mph. On Sunday 28th April 2019 the sun will rise at 05:50 and will set at 20:27. It will be a mild day, with temperatures reaching around 6.2°C. Today is expected to be a dry day, with a very low chance of rain. There will be a gentle breeze in the air today, with a maximum expected wind speed of 18mph. 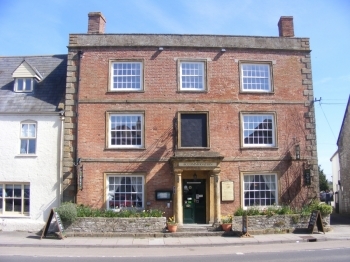 Situated in the picturesque village of Ilchester close to the A303 & between RNAS Yeovilton & Yeovil, The Ilchester Arms is a charming hotel, restaurant & bar where a warm welcome is always assured. Brendan, Lucy & their young energetic team are dedicated to providing the highest level of customer service & we take great pride in serving you our exceptional quality cusine made from local fresh produce (wherever possible) & providing you with charming & comfortable rooms. The Bar is open daily for hot & cold bevarages & the Bistro is open every day for Lunch & Dinner (except Sunday evenings). Brendan & Lucy are also the proud owners of The Bull Inn situated just across the road. The Bull is open every day from 12pm with food served 12pm-9pm Monday-Saturday.